Is It Time to Buy Norfolk Southern Stock? With the transportation industry showing signs of strength, can the railroad company tap into growth trends with its East Coast-centered network? The railroad industry has performed extremely well lately, as a rebound in the overall economy has spurred larger shipments of vital goods throughout the nation. Norfolk Southern (NYSE:NSC) is one of the country's major railroads, with a route map covering 20,000 miles and serving 22 states and the District of Columbia. Offering the most extensive intermodal network in the eastern U.S. and serving every major seaport on the East Coast, Norfolk Southern has taken advantage of the fuel-efficiency benefits it offers, but some investors worry that its geographical focus will leave it struggling to catch up to Union Pacific (NYSE:UNP) and Berkshire Hathaway's (NYSE:BRK-A) Burlington Northern Santa Fe and their access to the Pacific coast. Let's take a closer look at Norfolk Southern to see if it's a good time for investors to buy shares. Norfolk Southern intermodal network map. Source: Norfolk Southern. Norfolk Southern has set numerous all-time record highs over the past several years, with the stock posting especially impressive gains since late 2013. Like peer CSX (NASDAQ:CSX), which also has extensive East Coast exposure, Norfolk Southern has struggled from the big drop in coal-shipment volumes that accompanied the plunge in natural gas prices following the expansion of domestic oil and gas drilling activity. Historically, coal has been important throughout the railroad industry, and given Norfolk Southern's proximity to major coal-mining regions in the Appalachians as well as the electric utilities that rely on that coal to produce power, it remains especially sensitive to changes in coal demand, and when natural gas was at its cheapest, Norfolk Southern and its railroad peers fetched the weakest earnings multiples. More recently, though, railroad investors have felt more comfortable with Norfolk Southern, sending valuations higher both for it and its railroad peers. 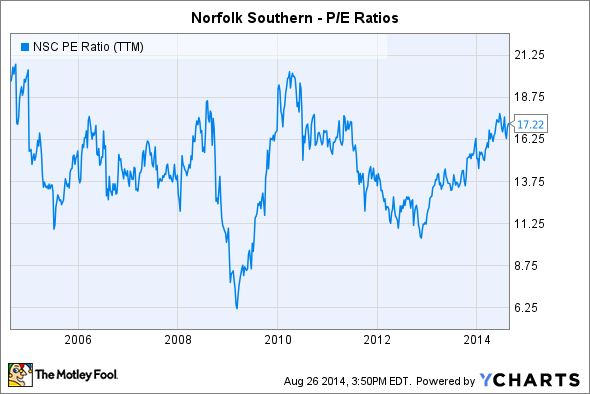 Norfolk Southern P/E Ratio (TTM) data by YCharts. Challenges like the cold winter held back growth early in 2014, and Norfolk Southern especially felt the hit, falling short of investor expectations in its first-quarter earnings results as weather-related delays weighed on its internal efficiency. Yet investors have looked toward the long run, seeing more favorable conditions in the industry as supporting Norfolk Southern's future prospects even during temporary times of trouble. How does Norfolk Southern fare against other railroads? At first glance, Norfolk Southern's high exposure to coal might seem like a huge competitive disadvantage. Even with natural gas prices having rebounded somewhat over the past couple of years, coal carloads remained weak early this year, and few predict that coal will ever regain the importance it had prior to the oil and gas shale-play boom. But to a large extent, railroads have done a good job of coming up with other sources of revenue even as coal has declined in importance. 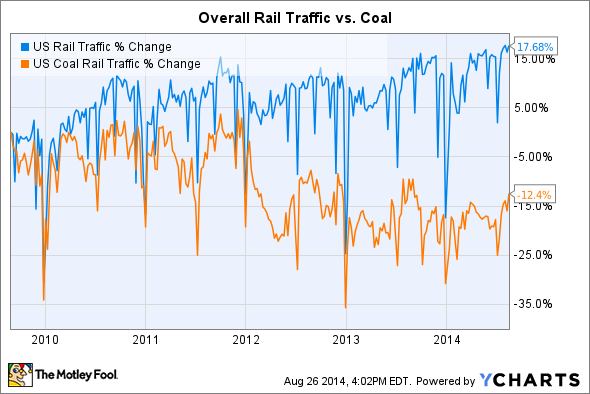 As you can see below, coal's problems haven't held back rail traffic figures more broadly. US Rail Traffic data by YCharts. Energy-related products have picked up much of the slack from lower coal demand, with two related but different sources of revenue. On one hand, energy exploration and production companies have become hungrier for the chemicals and other materials they need in order to use unconventional production methods like hydraulic fracturing, and railroads have replaced lost coal volume by providing fracking sand and other goods for those producers. At the same time, on the return trip, energy producers have increasingly used railroads to transport crude oil, as pipeline capacity simply doesn't exist in many of the newer, more remote shale areas in the country. Norfolk Southern still has greater exposure to coal than the industry average, but it's also working at diversifying its portfolio. The big question facing Norfolk Southern is where growth in transportation volume will come from. Commodity-hungry Asian markets prefer Pacific ports, and that would give Union Pacific and Burlington Northern an advantage over Norfolk and CSX. But if the efforts of coal producers to export more coal actually work, then Norfolk Southern will be in an ideal situation to meet increased transportation demand. Is Norfolk Southern a good buy right now? Norfolk Southern stock definitely isn't as good of a bargain as it was a year ago, with earnings multiples expanding and the pace of future growth remaining uncertain. Share prices already reflect some of the recovery that investors expect from Norfolk Southern as it figures out its coal conundrum. Nevertheless, if you believe that the U.S. economic expansion is just getting started rather than being ready to stall out, then Norfolk Southern is poised to profit from the ongoing expansion.